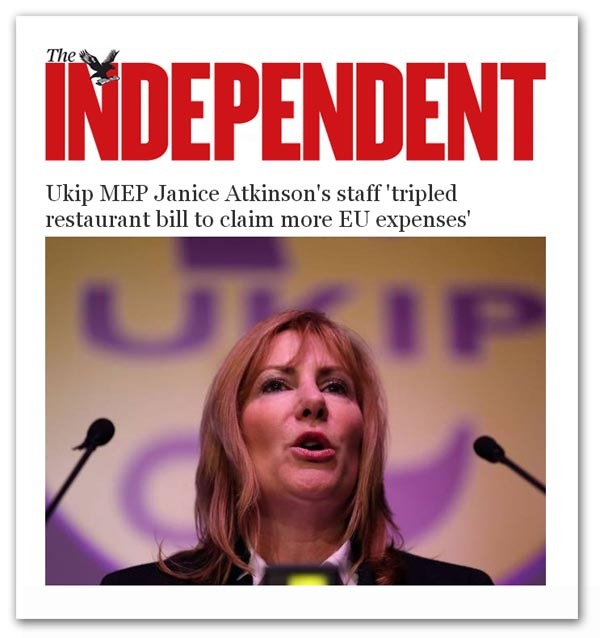 Confronted with The Sun's claims that UKIP MEP Janice Atkinson had conspired fraudulently to inflate a restaurant bill, a source said she appeared "very, very surprised" that she was being criticised. "She doesn't see what she's done wrong. I think she's genuinely dense enough not to realise this is not the way things happen", he said. And that, in many respects, is all too typical of the Ukip hierarchy. Tthey just don't get it – and not just this particular specimen of Ukip dross. But this is the one who, only two weeks ago, was predicting she was going to take Folkestone and Hythe from the Conservatives at the general election, and was claiming she had the evidence to prove it. Well, there is one prediction I can confidently make: Atkinson, who infamously referred to a Thai woman as a "ting tong", and has been taken to court by the Child Support Agency over missed support payments to her ex-husband, is not going to be an MP in May (or ever). She has been suspended from the party, dropped as the Folkestone candidate and has had the party whip withdrawn. And all this happened after The Sun filmed Christine Hewitt, Atkinson's assistant, asking a restaurant manager for an invoice for a party in Margate that had cost £950. She asked for a higher sum and eventually was given an invoice for £3,150. "The idea is we overcharge them slightly because that's the way of repatriating [the money]", Hewitt was filmed saying. Apparently, the restaurant manager had agreed to take part to enable video footage to be obtained, The Sun said, indicating that this was most probably a "sting". And legal experts are saying that the action of Atkinson and her chief of staff could be viewed as "a criminal fraud" and should prompt a police investigation. European laws on expenses and party funding may also have been broken. We may yet see another MEP in prison. Thus, when it comes to "not getting it", The Great Leader Farage says: "I am astonished she could have done something quite so stupid. I am very very shocked and surprised". He must, of course, be about the only person in the world who is surprised, which provokes a somewhat hollow laugh when he declares: "I want Ukip to be the party that restores decency into our political sphere, and as such, I will do my level best to uphold those principles across the entire party". Perhaps our Janet should have thought about this when she gave this speech, in which she said: "Ukip believes in women … If you believe in Britain, and you believe in women, then vote Ukip". Clearly, Ukip no longer believes in this particular woman. Then, it appears that most of the country doesn't believe in Ukip. The party has peaked, but no one wants to admit it", says Suzanne Moore in the Guardian, adding: "Nigel Farage now resembles every other politician". "A political force grounded in disenfranchised resentment can only fizzle out when faced with the realities of governance", she then went on to say - words written before Atkinson had been outed. Now that, yet again, Ukip has been shamed - and not by its enemies but by one of its own - Moore's words might actually seem prescient, had we not been saying much the same for many months. Ting Tong, the witch is dead says TCB. How long before the rest of the party follows?